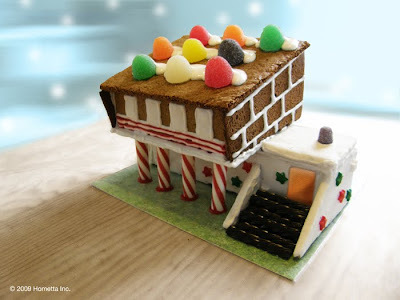 Hometta is giving away free modern gingerbread house plans for Draft House, one of a dozen small modern house designs available at Hometta.com. Draft House is the product of Minneapolis and Houston-based studio HouMinn Practice. The plans for the 'Gingerbread Draft House,' which include detailed instructions on how to build this contemporary confection, can be downloaded at Hometta.com until the end of the year. As a bonus, Hometta members are automatically entered to win a Gingerbread Draft House Kit that includes all of the supplies needed to construct the little guy. The winner will be announced December 15, 2009. When Hometta is not giving away free gingerbread house plans, the company offers an array of modern home plans under 2,500 square feet. Additionally, the designs are by award-winning studios from around the world. Considering the fees for the services of any respected architect, the plans go for a very reasonable price. Plans range from $1195 to $3195 and are purchased directly from the website. For a low $9 monthly membership fee (or $49 for a year), those looking to build a small modern home can virtually view – with potential local builders via up to five guest memberships – the entire set of construction documents for their favorite Hometta house. And that's not all. I personally prefer the more savory treats of the holidays. But I admit, the "snow"-covered gumdrops are very pleasing to my eyes.